Lakewood >> Mira Costa High senior Andrea Lee had a goal of winning the Knabe Cup individual championship and hoped to lead her team to the title as well. Thanks to birdies on her last two holes, Lee was able to edge out Diamond Bar’s Josephine Chang by one stroke, finishing with a 6-under 68 to capture medalist honors. However, Mira Costa shot a 299 but came up a stroke short of the team championship as Diamond Bar successfully defended its title. La Serna finished third at 302. Senior Marni Murez finished at 1-over 75 for Mira Costa and junior Ashley Kim finished 3-over 77. But it was Lee who stole the show with long drive after long drive and also was able to make a lot of crucial putts, including birdies on the 16th and 17th holes. “I was just trying to think about my own game and not worry about what anybody else was doing,” Lee said. “It just kind of happened that I hit two good shots on the last two holes and then made my putts. It feels really good to win since this was my last year in this tournament. Lee wasn’t the only South Bay golfer to place. Torrance senior Nina Novilla also shot a stellar round, finishing with a 4-under 70 to take third place in the individual competition and helping her team to a sixth-place finish at 342. Peninsula junior Nicole Suppelsa also finished in the top 10 individually with a 3-over 77, good enough to tie for 10th place with Mira Costa’s Kim. But she was not satisfied with her round. Palos Verdes’ Cashel Downs (79) finished tied for 12th out of 108 golfers. Andrea Lee and Marni Murez breezed past the field Wednesday at the Bay League Finals at Lakewood Country Club, each posting 8-under-par-66’s to become Co-Bay League Individual champions. Sabrina Li of Palos Verdes tied Mira Costa’s Ashley Kim for second place, with each shooting a 73. In the Ocean League Finals, also at Lakewood, Torrance’s Nina Novilla easily outpaced the competition, shooting a 76 to win another Ocean League individual crown. West Torrance’s Daphne Yang took second place with 86. The qualifiers will play Monday at River Ridge GC in Oxnard in the CIF Northern Individual Regional. Mira Costa’s Andrea Lee shot a 73 as her team captured first-ever CIF State title. File Photo by Thomas R. Cordova-Daily Breeze Andrea Lee returned to the Mira Costa High girls golf team for her senior season to try and help her school capture a few championships. Lee and teammates Marni Murez and Ashley Kim led the way as the Mustangs captured their first CIF State championship on Tuesday at par-71 Poppy Hills Golf Course in Pebble Beach. Mira Costa’s team score of 391 edged second-place Walnut (394). Dougherty Valley was third at 402, Torrey Pines fourth at 412 and Carondelet fifth at 414. Murez shot a 1-over 72, recording five birdies, which helped offset six bogeys. Murez’s 72 tied for fourth place individually. She had birdies on the 17th and 18th holes, which gave Mira Costa a three-stroke cushion with one Mustang golfer still on the course. Lee was the last Mira Costa golfer to finish. She had to hold her team’s three-stroke lead down the stretch. She finished as steady as can be, recording pars on the last four holes. Lee’s 73 was good for sixth place individually. Kim shot a 75 to finish tied for 10th place for Mira Costa. Danielle Richman shot an 84 and Veronica Chen an 87 for the Mustangs. Mira Costa won the Bay League title, the CIF Southern Section Central Division championship and now the state championship this season. Torrance’s Nina Novilla competed individually, shot a 76 and tied for 16th overall. It marked the second consecutive year competing in the state final for Novilla. Lee won the state title individually as a sophomore before taking last year off from high school golf to focus on national junior golf. She returned with a bang, helping Mira Costa become the first South Bay team to capture a state championship since Torrance High in 2009. What is SoCal Prep Legends? An award show that will honor the best prep athletes in Southern California at the end-of-the-school-year. For more information, visit socalpreplegends.com, where you can also vote for the SoCal Athletes of the Week and Play of the Week. When star senior Andrea Lee decided to return to Mira Costa’s girls golf team this season, there was clearly only one goal in mind: winning a CIF State championship. Lee, the 2015 Daily Breeze Player of the Year, and her Mira Costa teammates made it look easy, rolling to the program’s first-ever state crown and winning a bunch of big tournaments along the way. Lee, one of the nation’s top-ranked junior golfers, stepped away from the Mira Costa program last year to focus more on her outside golf endeavors. After taking care of one of her individual goals, winning the Knabe Cup title, Lee and the Mustangs set out for team dominance this year. Mira Costa cruised to a Bay League title, which was no big surprise, before Lee’s 4-under-par-70 led the Mustangs to a victory in the CIF Southern Section Central Division team finals. The crowning achievement came in November, when Lee and Mira Costa edged Walnut by three strokes to capture the CIF State title. Lee’s 73 was good for sixth place individually, and was key in Mira Costa’s victory. Lee, who was named the 2014 Rolex junior Player of the Year, will play at Stanford next season. “Andrea had a great influence on the team. She came back because of her bond with them,” Mira Costa coach Tom Cox said after the team’s state title. Given the array of talent it had, Mira Costa was in many ways, almost expected to contend for and even win a CIF State championship this season. Plenty of highly-touted teams and all levels of competition stumble and fall, but Mira Costa didn’t falter under the pressure. Cox steered the talented Mustangs to the program’s first CIF State crown and looks to have the program churning out quality young golfers to keep the momentum going in the future. NOTEWORTHY: Boston College-bound Murez was key to Mira Costa capturing its first-ever state championship in girls golf. Murez birdied the 17th and 18th holes at the challenging Poppy Hills Golf Course in Pebble Beach. Murez finished with a 1-over-par 72, good for fourth place overall and tops on her team. Her performance allowed Mira Costa (391) to edge Walnut (394) for the championship. The Mira Costa girls golf team took first place with a 366 in the CIF-WSCGA State Regionals at par-71 Goose Creek Golf Club in Jurupa Valley on Thursday, and Torrance’s Nina Novilla finished seventh individually to advance to the CIF State Championships. Andrea Lee of Mira Costa had the top score of the day with a 7-under-par 64, and her teammates were on point as well. Marni Murez shot a 71 and Ashley Kim shot a 72. Danielle Richman had a 77 and Veronica Chen shot an 82 for Bay League champion Mira Costa. Peninsula’s Nicole Suppelsa also competed but did not advance. The top three teams and the top 12 individual players advance to the CIF State Finals at Poppy Hills Golf Course in Pebble Beach. Walnut took second behind Mira Costa with a 374. It marks the second straight year Novilla has reached the state final. Lee won the state title in 2013 before taking last year off from high school golf. Lee, one of the top prep players in the nation, won the Knabe Cup this season and was co-champion of the Bay League before shooting a 4-under-par 70 to lead Mira Costa to a CIF Southern Section title. It marks Mira Costa’s first-ever state championship appearance. “It was an amazing day,” Mira Costa coach Tom Cox said. 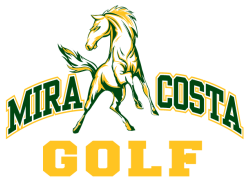 The Mira Costa girls golf team was one of four teams to emerge from CIF-SS/WSCGA Team Qualifiers on Thursday, advancing to the CIF/WSCGA Southern State Regional, which takes place on Nov. 12 at Goose Creek Golf Club. The Mustangs finished third as a team, shooting a 388. Walnut finished first with a team score of 366, followed by Palm Desert’s 387. Santa Margarita was the final team to advance, finishing fourth with a score of 392. Ashley Kim and Andrea Lee both shot a 4-over 74 for the Mustangs. Marni Murez came in three strokes behind with a 77. Danielle Richman fired an 81, followed by Veronica Chen’s 82 and Lexi Nielsen’s 85. Mira Costa won the CIF-SS Central Division title on Monday after Nielsen won a tiebreaker for the Mustangs. Cox said the team’s depth has been a main reason for its success in the playoffs. Palm Desert’s Jiyoon Jang won the individual title. It’s usually a given that Mira Costa’s girls golf team is going to get strong performances from golfers like Andrea Lee, Ashley Kim and Marni Murez. Monday, however, it took a total team effort for Mira Costa to capture the CIF Southern Section Central Division Team Finals in dramatic fashion. Mira Costa tied with three-time defending champion Diamond Bar 395-395, but pulled out the victory thanks to the 14-over-88 of its sixth golfer, Lexi Nielsen, whose score bested that of Diamond Bar’s sixth golfer to give the Mustangs the edge. Lee was her usual dominant self, shooting a 4-under-70 to lead Mira Costa. Murez shot a 76 and Kim shot a 78 for Mira Costa. Danielle Richman shot an 85 and Veronica Chen shot an 86. Mira Costa advances to the CIF-SS/WSCGA Team Qualifiers on Thursday, Nov. 5 at Western Hills Golf Club in Chino Hills. NOTEWORTHY: Lee captured the Knabe Cup individual title at the Lakewood Country Club by recording birdies on her last two holes to win by one stroke with a 6-under-par 68. Lee led Mira Costa to a second-place finish overall. She had to be on point down the stretch to win the individual title and she came through in a big way with precise work on the greens. An award show that will honor the best prep athletes in Southern California. The Daily Breeze nominates and boys and girls Athlete of the Week and a Play of the Week each week. For more information, visit socalpreplegends.com, where you can vote for the SoCal Athletes of the Week. Mira Costa’s girls golf program is thinking big – really, really big – and it’s not hard to understand why. The Mustangs have a host of talented players back from last season’s Bay League championship team, but the most important piece might be the one who didn’t even play last season. That would be Andrea Lee, one of the nation’s top-ranked junior golfers, who sat out last season to focus on her many non-high school golf endeavors. This year, Lee is back with the Mustangs, at least as her busy schedule permits, and has Mira Costa gunning for a deep run in the CIF playoffs. Having Stanford-bound Lee, winner of the 2014 American Junior Golf Association Player of the Year Award back is just the icing on the cake for a loaded Mustangs team. Aside from Lee, Mira Costa returns essentially all of its top golfers from last season. Marni Murez, Ashley Kim, Danielle Richman and Veronica Chen are all back, teaming with Lee to make a top five that should give nightmares to other golf teams across Southern California. The Mustangs are also deep, with players like Lexi Nielsen, Phoebe Gunn, Briana Andrade and Carolina Hanna rounding out the roster. ALSO IN THE BAY LEAGUEPalos Verdes loses several key senior leaders, but does have talent back led by Alison Hsieh and Cashel Downs. PV coach Ray Rivera always fields a competitive squad and this season should be no different. Junior Nicole Suppelsa leads Peninsula as it hopes to jockey for second place in the Bay League with its rival across the hill. Momoka Sasaki and Hana Kodaka should also be key contributors for Peninsula. Redondo has the unenviable task of replacing Robynn Ree, who is now at USC. Coach John Burke expects this to be a rebuilding year, with sophomore M.V. Baker and senior Carlin Liang leading the way. OCEAN LEAGUETorrance is bolstered by the return of reigning Daily Breeze Player of the Year Nina Novilla for her senior season. Novilla had a strong junior season, tying for first place at the CIF Women’s Southern California Golf Association Regionals and leading Torrance to its 12th Ocean League title in 14 years. Her presence, along with the presence of senior Rylie Tanoura, make Torrance the clear favorite in league play. West Torrance will forge ahead without star golfer Kasey Torres, who transferred out of school over the summer. West will be led by Daphne Yang, Katherine Fukuda, Juliene Eng and Jasmine Arrieta. South Torrance, with Alexa Hernandez, Shelby Kidman and Niki Chung, along with North with Teri Sakatani and Miah Mouton should also be competitive in league play. Members of the Mira Costa girls golf team had one goal in mind when they kept nagging Andrea Lee to join them for one last season: they wanted a state championship. The Mustangs got their wish. They got Lee, and on Tuesday they got their title. Lee and fellow senior Marni Murez led the Mustangs to the program’s first state championship as Mira Costa shot a combined 391 to edge second-place Walnut by three strokes in the CIF state championship at Poppy Hills Golf Course in Pebble Beach. “This is what I came back for,” said the Stanford-bound Lee, who won the state individual title as a sophomore before taking last season off from high school competition. “My teammates persuaded me to come back. They said this is our last chance and we could do something big. They lured me back and I’m really glad they did. Murez was the Mustangs’ top finisher, tying for fourth place at one-over-par 72, three strokes behind individual champion Alyaa Abdulghany of Corona del Mar. Lee shot 73 to take sixth place. “They’ve been our one-two punch all year,” Mira Costa coach Tom Cox said. “You can’t say enough about what they’ve done. Marni, it was her guttiest performance of the season … but I’m proud of the whole team. Junior Ashley Kim also finished in the top 10, tying for eighth place at 75. Danielle Richman (84), Veronica Chen (87) and Lexi Nielsen (111) rounded out the Mira Costa contingent in what was the team’s first berth in the state tournament. “It’s extremely exciting,” Murez said. “It’s my last high school tournament ever, and to go out as state champs, something we’ve been working for all year, is amazing. Murez was the event’s early leader as she birdied two of her first four holes. However, her sixth bogey of the day left her three-over and in 12th place after 16 holes. She responded with the Mustangs’ performance of the afternoon. She birdied her final two holes, including the par-5 18 in which she had to play out of the sand trap. Murez didn’t realize just how valuable her finish was until she stepped off the course and was informed that Mira Costa’s once-nine-stroke lead over Walnut had shrunk to a few strokes. The amount of attention being paid to her, though, was enough to make her sense the gap was closing and create what she described as a “really nerve-wracking” experience on her final holes. Lee, meanwhile, said she didn’t feel any extra pressure because she was unaware of the standings. As the final Mustang off the course, she wondered why her teammates were excitedly running toward her.